Holy cow, that was a heckuva building, I have never heard of it. If you squint it looks like Chicago or sumpin'. In other totally unrelated news, former Flint Powers puckster Ron Rolston is named coach of the Buffalo Sabres. He scored 94 goals in one season of high school hockey!!! Pretty impressive until you consider at least half of them were scored against the likes of Goodrich, Mt. Morris, Flushing, Clio, and the (former) perennial whipping boy of the GCHSHL- Flint Northern. Is Rolston considered a Flintoid? Grew up in Grand Blanc or Lake Fenton, I think, and went to high school in Mt. Morris Township. You're right. Powers isn't Flint. RR is a phony, phaux Phlintoid. Ken Morrow, Bobby Reynolds, Brian Rolston, Shawn Cronin, and Jim Slater are similarly disqualified. Skating at IMA doesn't count. Tony Szabo is as Flint as they come, but he made his mark in pro roller hockey and the minor leagues. Unfortunately that leaves us with just Tim Thomas. Even though he graduated from Davison, his Flint bonafides as a kid growing up on the Eastside and playing at Whaley are solid. I say unfortunately because dude is straight up kooky. He admires Glen Beck, refuses to visit the White House with his Stanley Cup winning teammates, and is "sitting out" this season because he allegedly believes the world is gonna end soon. Put him on the same shelf as Andre Rison and Javale McGee. The Mata Boys Downtown Flint Tour 1979 RULES! Their optical illusion producing camera perfectly captures Flint on the cusp of collapse. Just realized that David Mata is shooting photos of the the photos and sending them to me, so the edges may be curling up a bit and creating the effect. Intentional or not, it does give them a dramatic feel. If Mary Fisher's shots capture the fifties, the Mata Boys have captured the late seventies/early eighties Flint. These shots are really the Flint I remember. Big ups to the Mata Boys, but Tom Wirt is the Ansel Adams of Flint. Tell David Mata to keep repeating his photgraphic process. The end result will be a psychedelic masterpiece. Where will the roving Mata Boys appear next. I'm guessing Windmill Place or Doyle Ryder. Seems as if the Mata Boys are harbingers of doom and demolition. Sill, Bldg., Kobacker Bldg., Riverbank Sculpture were all history shortly after they had their pictures taken with the brothers. I'll bet there are pictures of them circa 1996 in front of Autoworld. As I recall, the late Yolanda Juarez Naismith, Great Aunt of the Mata Brothers as I am told, used to do a half hour Spanish Language show at WFDF, called "Fiesta Amigos" back in the 1970s, from the building to the right of the sculpture shown in that other picture. Later, one set of Mata Brothers did a Spanish show on WFBE and WWCK-FM. I'm not sure if these are the same set of Mata Brothers. The Kobacker Building had an interesting diamond shaped design in the facing, and different color bricks that spelled out the Kobacker name. Hey Flint streets guy/gal...are you Smurfs Inc. from the early days of the blog? I think there are at least four of us using given and surnames from street names. Mr. Barney owned Barney Cut Stone, and Mr. Mann and Mr. Hall were home builders who built on the opposite sides of streets in that area. It is both entertaining and fascinating to explore these names and their origins. The history explored clashes greatly with the present state of the City of Flint and the way the media portrays it, and I hope people reading these posts realize Flint's rich history. 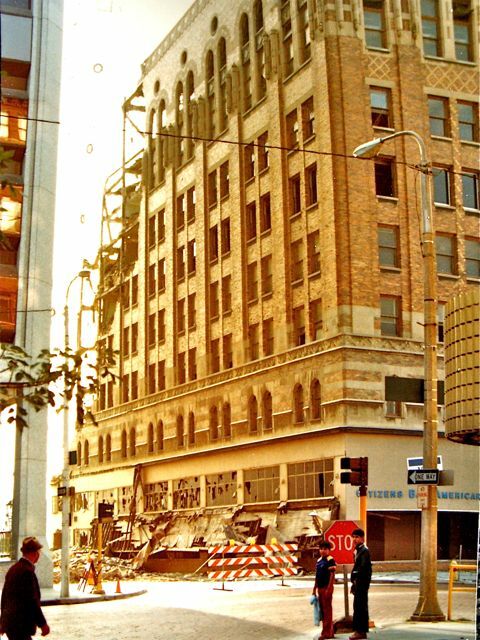 The Kobacker tag didn't get me any other hits, but maybe this was covered here at some point but not tagged: what was the Kobacker Building in its early life? This is very deep photo. Gordon, do you know of any photo's of Berston Field House? Ben Mata was my good friend at Flint Central in the very early 70's. It was a great time,a great place,with great people. We had us a time, We did. All who followed cannot really understand. We broke new ground,defied the Power,and came together as one. Highlight of my life!